Carina scored two tickets to see Henry Rollins at the Ohio Union, as a Valentine’s Day gift to me. I realized as we waited in line that it was one year ago to the day that we last saw him. Today is Rollins’ birthday (he’s 44), and the student organizers gave him a big boquet of roses, and a few small wrapped gifts. At the close of the show we all sang “happy birthday” to him. Tonight’s show was much more political than last time (and that’s saying a lot). Rollins was quite vocal in his opposition to the Bush agenda, but he’s in a unique position to lodge specific complaints against it. He told us about his tours with the USO, visiting service men and women in Iraq, Afghanistan, and elsewhere. He (still) has nothing but praise for the men and women he meets. It was refreshingly eye-opening to hear him talk about the work our troops are doing with farmers along the Afghanistan / Pakistan border – something about which the news outlets consistently fail to report. Rollins spent a long time talking about his latest USO gig – visiting the wounded soldiers in the Army hospitals in and around Washington. It was heart-breaking to hear about the suffering of these young people. And not just them, but their families, too: the man without legs with pictures of his girlfriend – how long will she stick around? The men without hands or arms, with their wives and parents trying to be strong at their bedsides. After the show I jokingly said to Carina that we should wait outside at the bus, to snap a photo. Carina’s eagle eyes spotted Rollins down the hall, so we joined the small crowd gathering around him. I felt bad, selfishly asking for a photo on his birthday just after the show. He looked tired, but he graciously consented. 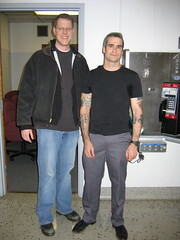 Of course, my one chance for a photo with Henry Rollins and I’m caught mid-blink! It’s three years in a row that Carina and I have seen Rollins. As long as he keeps coming to Columbus, we’ll keep watching!